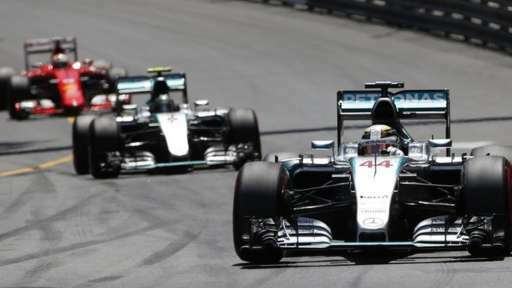 Nico Rosberg has won the 2015 Monaco Grand Prix despite team-mate Lewis Hamilton dominating for most of the race. Hamilton had been on a controlled drive when the Mercedes team elected to pit him after a heavy crash for Max Verstappen that bought out the safety car. This moved Hamilton into 3rd behind his team-mate and Sebastian Vettel; a position that he would be unable to advance from. The hottest temperatures of the weekend greeted the drivers for the Monaco Grand Prix, with the risk of rain almost invisible as a contrast to Thursday practice. Lewis Hamilton managed to hold the lead on the run down into turn 1, with Sebastian Vettel almost demoting Rosberg to 3rd before the Mercedes driver held the position around the outside. Dannil Kvyat slipped by his team-mate to get into 4th. Fernando Alonso’s hopes of getting points took a small blow early on as he muscled his way past Nico Hulkenberg at Mirabeau. The pair madecontact which put Hulkenberg into the wall, breaking off his front wing. The contact earned Alonso a 5 second penalty that would be added to his first stop. Back at the front, Lewis Hamilton was capitalising on his good start by putting in a number of fastest laps to break free of Rosberg’s DRS range. By lap 10, Hamilton had a 3 second lead over his team-mate who was struggling to replicate the leading pace. The trend of Ferrari having a quicker car in hotter conditions seemed to be apparent on the streets, with Vettel not being dropped by Rosberg as much as you may have thought. The order of the leading trio remained static for the entirety of the opening half of the race. Even when the one and only pit-stop window came around lap 40 of 78, Hamilton retained the lead as Vettel and Rosberg pitted prior to him. Vettel jumped first as he tried to make an undercut work as it had done previously in Bahrain. Unfortunately for him it wouldn’t work out and Rosberg would re-join just ahead. Hamilton would also have an untroubled pit-stop as he rejoined with an 11 second lead in hand over his team-mate. It’s fair to say that the race didn’t live up to the excitement that we may have wished it had, but the race flew into an exciting crescendo in the closing stages in a controversial and unexpected twist. 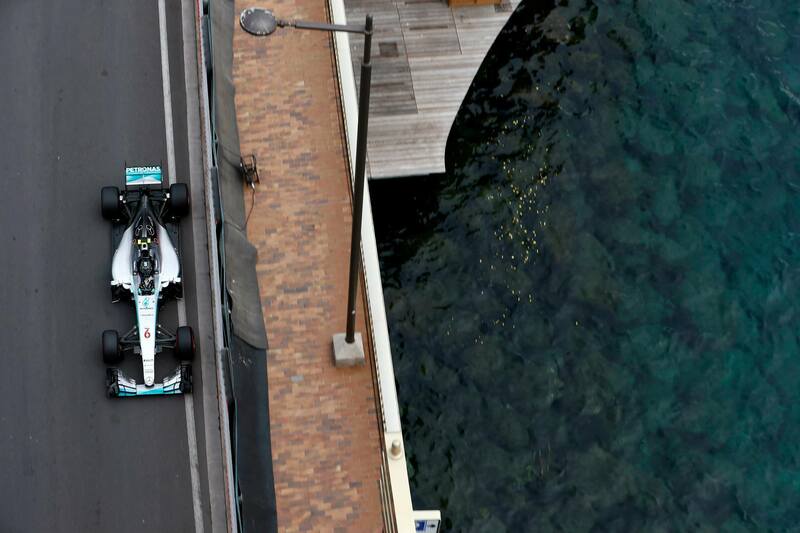 Monaco’s tight and twisty nature has historically lent itself to be the scene of very few overtakes, so when the opportunity arises it either ends in a sensational move or a hard hit into the barrier. The latter was sadly the case for Toro Rosso’s Max Verstappen. Verstappen was chasing down Romain Grosjean for the minor positions in the top 10. He re-joined after his stop with much better tyres and pace than Grosjean’s Lotus. The pair were soon being lapped by Sebastian Vettel in the Ferrari, with Grosjean needing to let the Ferrari through without letting Max by; with the Dutch driver aiming to use Sebastian to help get by. Grosjean cunningly waited until the Lowes hairpin to let Vettel through, which allowed Romain to keep the position. 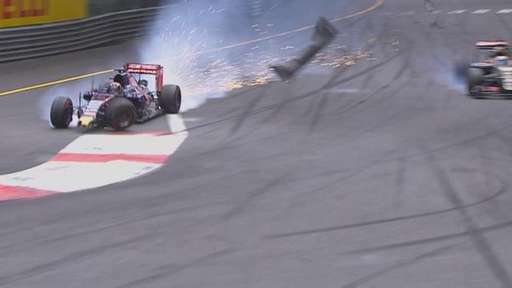 With his tactic of using the faster car to create the hole failing, Verstappen now had to try and get by the old-fashioned way; which at Monaco is no mean feat. The Toro Rosso driver looked as feisty as ever as he clung onto the gearbox of the Lotus. The pair came down the start/finish straight on lap 62, with Max lining up to make a move into Saint Devote. Max seemed to misjudge the gap however, as he clipped the right rear of Grosjean’s Lotus. The contact completely broke his left-front and left him out of control as he hurtled toward the barrier. The contact was heavy, but Verstappen soon climbed out of the car. The huge smash required an extensive clean-up operation, with the Armco barrier needing to be replaced for the second time on race-day after an equally massive crash in the Formula Renault 3.5 support race at the same turn. The safety car was deployed, but logic would dictate that no one near the sharp end of the field would want to pit as track position has always been key in the Monaco Grand Prix. Mercedes disagreed. Mercedes elected to take the risk and pit race-leader Lewis Hamilton, who had led every single lap of the race, because they thought that he had enough of a gap to re-join ahead of Rosberg. This may have been the case had it not been for the stray Sauber of Nasr deciding to pit just after, meaning that Lewis had to be held marginally longer then he may have wished. Hamilton exited the pits, but Rosberg and Vettel had gotten the jump on him to push him down into 3rd; a cataclysmic error for Mercedes especially when they didn’t need to do the stop anyway as the tyres would have lasted and no one else was going to pit behind him. Hamilton was fired up after his team’s mistake. The safety car came in at the end of lap 70 after an unnecessarily long safety car period in order to let lapped cars by. This meant that there were only 8 laps to go and at a track where overtaking is rare, the odds weren’t in Hamilton’s favour. Rosberg sprinted away when the safety car peeled into the pits, with Vettel soon having to use his elbows to keep Hamilton behind. Hamilton may have had the pace advantage, but there was simply no way by thanks to Vettel’s expert defence. With that, despite having tailed his team-mate for almost the entire race, Nico Rosberg would claim his 3rd consecutive win in the Monaco Grand Prix; his first ever back-to-back victory and one that equals Ayrton Senna’s record from the 1990’s. Sebastian Vettel would hold on to take 2nd place ahead of Lewis Hamilton, with the Mercedes driver having to focus his attention on a late charge by Daniel Ricciardo. Ricciardo had been behind team-mate Kvyat in the last few laps before his team ordered the Russian to move over so that the much faster #3 car could have a go at challenging Hamilton. With the challenge not succeeding, the team decided to give the positions back again; with Kvyat coming home for a career best 4th place ahead of his team-mate. Kimi Raikkonen came home in 6th place, but felt aggrieved after an aggressive move put on him by Ricciardo at Mirabeau went unpunished. Sergio Perez took 7th place in a great result for Force India, with Jenson Button taking McLaren-Honda’s first points of the year in 8th place. The team had targeting scoring points in the run up to the weekend and will be pleased to have accomplished this, but will also be saddened after their second car of Fernando Alonso retired with a gearbox issue whilst running in the points paying positions. Instead, rookies Felipe Nasr and Carlos Sainz would take the final two points positions; with Sainz putting in a great drive after starting from the pits in his Toro Rosso. Today’s controversial strategy error for Mercedes means that Lewis Hamilton’s lead in the drivers’ championship has halved to 10 points over team-mate Nico Rosberg. A furious Hamilton will be aiming to get back onto the top step of the podium at the sight of his first ever Formula One victory in 2 weeks time for the 2015 Canadian Grand Prix at the Circuit Gilles Villeneuve in Montreal.